Reading about training for climbing, you can get the impression that the key ingredient is effort, expending energy and building power. 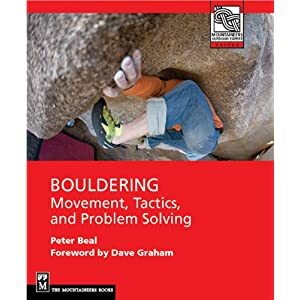 While I would agree that such training is a vital part of becoming better at bouldering, for many a steady diet of such climbing becomes counterproductive leading to plateaus and stagnation. My remedy for this situation is to spend a few sessions doing lots and lots of easy yet creative climbing. At Flagstaff Mountain, behind Boulder, where I spend a lot of time bouldering, there is a great concentration of boulders and formations offering a seemingly infinite number of problems at very easy grades. Within a few hundred square yards, I can find 30 or 50 short problems that allow movement of virtually any type on all kinds of holds and features, ranging in difficulty from 5.6 to V5. So occasionally I will spend 30, 45 minutes or more climbing continuously on this kind of terrain, never stopping to figure out moves or try the problem twice. I also try to work in downclimbing and traversing to connect problems, always trying to maintain the flow of movement. Why does this help make you a better climber? It works in a number of ways. First, you are spending time climbing instead of sitting around, moving gear, chatting with friends, taking off shoes, etc. So you are upping the volume of climbing considerably and aiding in general aerobic conditioning. In one of these typical sessions I am probably logging between 400 and 600 feet of climbing in under an hour. Second, by emphasizing continuity of movement, you are building better balance and smoother transitions between moves and stances, the kind of movement skills that can help considerably in much harder contexts. Third, you are experiencing multiple climbing situations in rapid succession and problem-solving quickly as you move through them, a learning exercise that allows much faster ascents and even flashes of harder problems. Fourth, you are building in greater variety of grip and body positions, helping prevent injury and strengthening little used muscles. Fifth, by building the sense of flow in a comfortable and low-stress way, you are aiding the formation of robust subconscious muscle memory that will assist you when you are tired and under stress, as in a problem at your limit. Shaping practical and productive movement patterns that you can maintain even in marginal situations is what climbing training is ultimately about. Circuits can't replace the hard work of developing the pure strength required in developing finger and arm power. But they can help train that power to work more productively and can allow a good training day when the "snap" just isn't there. You can also use this kind of training as a great warmup, provided you keep the difficulty very low and don't get pumped. 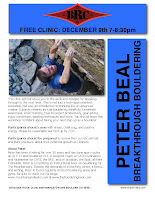 One key is continuous uninterrupted movement, which when you think about it is very rare in most bouldering sessions. The other is avoiding repetition of problems you have wired in the same order and the same beta. Seek new problems, contrive different sequences, and constantly see possibilities for new easy problems in order to keep the session fresh. Varying pure power sessions with a few of these easy circuit days may be just the remedy for that heavy burned-out feeling from too much training. A warmup/endurance circuit at Flagstaff from peter beal on Vimeo. 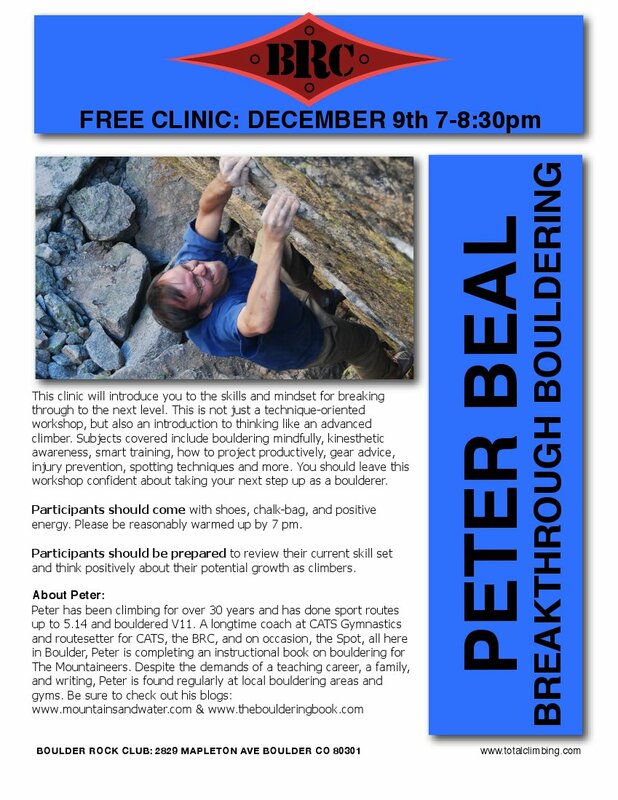 After some speculation whether anyone would show up, I had at least 10 people at the Boulder Rock Club last Thursday night for a clinic that went close to two hours. I started off explaining my philosophy of climbing better, namely paying better attention to what you are doing and understanding why. To me this is the essence of maximizing your potential as a climber and yet is so hard to do well. Then we had a little bit of falling practice. Much like in sport climbing, safe effective falling technique is crucial to feeling confident trying moves. Because trying harder moves is the key to doing harder problems, I wanted the participants to feel free to fail safely. After the opening part, I had people move through a relatively easy but steeply overhung sequence getting them to think about body position,foot placement and speed. I am not trying to critique their climbing so much as open up other possibilities for thinking about climbing. Then we tried a long dyno type move, working on seeing the differences that momentum and foot placement can make, as well as speed of execution. Another harder problem was used to illustrate the need to make the most of good foot choices to use smaller handholds. Finally I made some suggestions about effective bouldering gear, especially slippers, as many intermediate boulderers use shoes that are too stiff and take too much time to put on and take off. I also showed them what makes a good crashpad (representing Organic!) and why you need one (or two, really). I answered a ton of great questions. I had a few chalkbags to distribute, courtesy of Chris Danielson at Trango climbing, and some free chalk, courtesy of Metolius, as well. I will be working on the schwag for the next clinic, for sure. Where to hold it next is the question. "I was lucky enough to go to the clinic, and it was great. Thanks for all the good advice! I thought it was a great balance of on-the-wall work, and mental training. I got some new perspective on trying hard, redefining failure and success, and some great training and technique tips. I'm ...trying to break out of the v5/6 grade, and I got a lot out of it. I'd go to another one of these in a heartbeat." Definitely looking forward to doing more! If you think your gym might be interested, let me know.